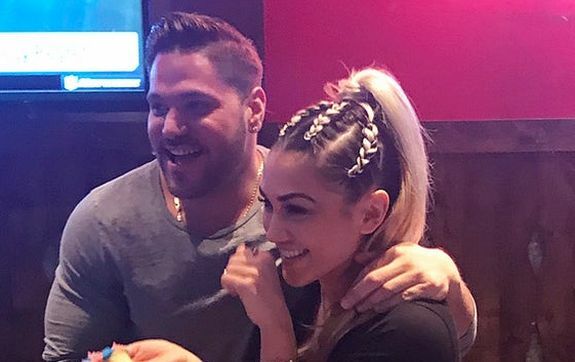 Finally, Ronnie And Jen Harley Got Engaged!? Ronnie and Jen had turned their boat towards Couple therapy! We know that their violent fights had shocked everyone, especially the dragging Ronnie by car had popped out the eyes of many people! Well, to make their relationship work they turned their punctured boat towards Couple Therapy. It’s seven hours of therapy a day. It’s like school and then you take a f***ing final.” Ronnie said to the sources. What his dear ones react to the decision? Jersey Star celebrates Baby mama birthday! The hustling couple was spotted together at Sugar Factory Ocean Drive on Monday night which is in Miami. The couple was seen holding hands and both seemed very happy! Ronnie and Jen “very much in love” at Mike’s Wedding! The castmates are happy about the couple! Ronnie’s dear friends were not happy about the couple being together! But at Mike’s wedding, their perspective changed! An insider told to the sources that, “Even Ronnie’s Jersey Shore cast members let him know how much they enjoyed having Jen there,”. “They love seeing Ronnie happy.”, insider added. Are the couple finally engaged? Well, you can see the flashy diamond ring on the hand! So are they are finally engaged? Jen was spotted with the diamond ring with Ronnie near the Beverly Hills and the ring can’t go unnoticed! The ring is on the finger that connects to the heart! But here is the sad news! Fans Go Crazy After Ariana’s Big Announcement! Find Out!